Diana Hirsch is our guest tangler this week for challenge #58. Diana is bringing awareness to the Four Diamonds Fund which raises money for childhood cancer. Brave 14 year old Christopher Millard created his symbol of four diamonds to descibe his struggle with cancer. Read his wonderful story about courage, wisdom, honesty and strength at the Four Diamonds Fund site. Thank you Diana. I love how vibrant this design is, even though it is B & W (& gray). 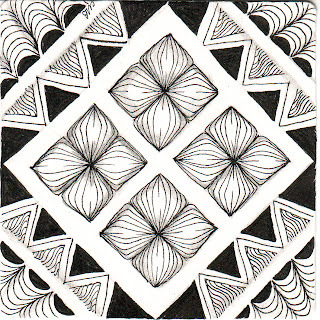 Another beautiful piece from one of my Zentangle heroes. This is so graphic. Simple, yet not, angular, yet not - a great design for the prompt. This is so striking. It has an elegant appeal. Oh, I really really like this - clean, clear and yet the design pops! Love your little puffy flower diamonds!! Beautiful tangles. I love how you've maintained the angularity but still given it wonderful softness. Soft beautiful flowers with bold lines around it....love it! Great design! 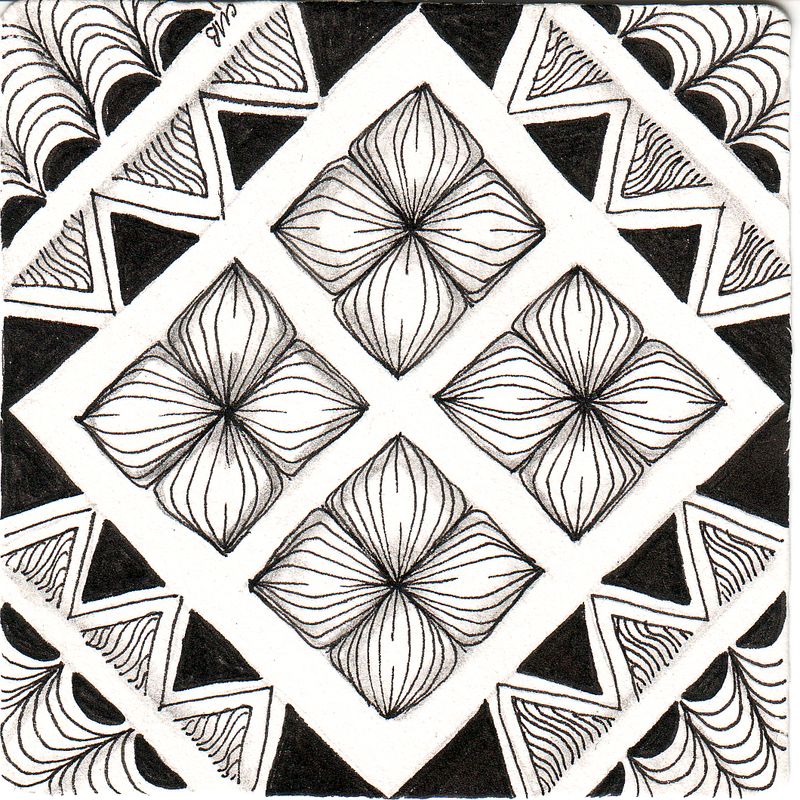 I really dig symmetrical designs! This is fabulous, love your texture and, of course, your style! Oh, I just love the depth. The lines are sharp but not hard, making this tile flow. I see flowers in the middle, with the negative space of the Four Diamonds logo melting into the design. (I typed this response before reading others' comments, so it's wonderful to see everyone interpreting your tile.) Thank you for participating in my challenge and for sharing your art. I feel bouncy looking at it! I like the way the centers of the flowers sink in and the corner pieces also seem to "fall" away out of the picture. Very strong graphically. I love the flow and soft angularity, if that is a word?